The rogue’s life has been good to William Somerhall: He has his fortune, his racehorses, and his freedom. Then he moves in with his mother. It seems the eccentric Dowager Duchess of Worth has been barely skirting social disaster-assisted by one Miss Jenna Hughes, who is far too bright and beautiful to be wasting her youth as a paid companion. Now home to keep his mother from ruin, William intends to learn what’s afoot by keeping his friends close – and the tempting Miss Hughes closer still. . . .
He’s tall, dark, and damnably intelligent – unfortunately for Jenna. She and the duchess are in the “redistribution business,” taking from the rich and giving to the poor, and it’s going great – until he shows up. But even as William plots to make an honest woman out of her, Jenna will use all her wiles to reveal just how bad a rogue he can be . . .
William Sommerhall, Duke of Worth, enjoys the good life. He’s handsome, rich, fun-loving and indulges his passion for breeding racehorses. Quite concerned with the gossip about his mother’s eccentricities, he pays her a visit and when he witnesses firsthand the pandemonium caused by this behavior, he decides to move in with her to put her life to rights and redeem her reputation. For both the Dowager Duchess of Worth and her companion, Jenna Hughes, this decision comes at the worst time as the Duke’s presence is sure to throw a wrench in their business. Both women have been playing Robin Hood at the races for a while, something that the upstanding Duke of Worth will not condone. William is seen to be a leader in horse-racing circles and is very vocal about ridding the sport of all dishonor. A GOOD ROGUE IS HARD TO FIND starts out on a very hilarious note and had me laughing so hard I was in tears. However, the lighthearted tone takes a more serious turn as the details of the schemes involving Jenna and the Dowager Duchess are revealed. Underneath the glamorous lifestyles of the ton is the dishonorable behavior of failing or refusing to pay debts owed to the tradesmen and the lack of legal options available to the tradesmen to recoup their monies. Jenna has been directly affected by this behavior and resolved to see such wrongs righted. Unfortunately, without a voice in the lawmaking process, alternative ways are devised leading to the scheme to recover, recoup and retrieve. The methods devised by the cohorts in this scheme to keep the Duke from finding it out were very funny and finding out that the Duchess’s eccentricities were a carefully cultivated cover was too much! I enjoyed the dialogue and had a really good laugh at the antics of the characters. However, some of the plot seems improbable and requires a huge suspension of disbelief. For me, some of the things Jenna was involved in brushed up against the illegal side and it made the romance with William seem a bit hard to believe, especially as he is such a straight and honorable man. 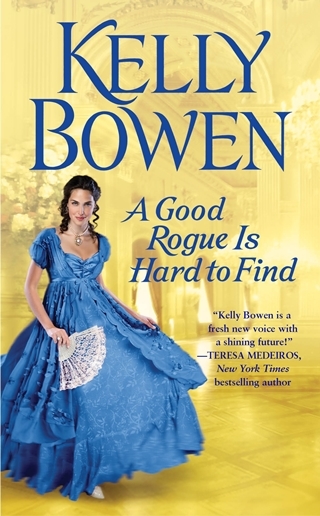 In spite of that, A GOOD ROGUE IS HARD TO FIND was still a funny and enjoyable read. Thank you so much for hosting A GOOD ROGUE!